As we age, there are areas of our face and neck that sag, loose volume and wrinkle. Injectable fillers (Restylane® and Juvederm®) are great non-surgical treatments to help fill in lines, creases and depressions to achieve a more youthful appearance. They are composed of a compound called hyaluronic acid, which a natural component of our connective tissue. Because of this, there is no real risk of an allergic reaction. Dr. Undavia is dedicated to helping you achieve youthful as well as natural looking results. As a dual Board Certified Facial Plastic Surgeon, Dr. Undavia has mastered the anatomical relationships of the face and neck so that after treatment, you don’t appear artificial and “frozen”. Best of all, results are visible after just one short visit with Dr. Undavia. The procedure typically begins after placing ice or a numbing agent on the areas to be treated. Dr. Undavia will then map out the areas to be treated in the normal upright position. The injectable fillers are placed meticulously, followed by a small amount of pressure to help reduce the risk of bruising and swelling, which is minimal. After the injection, a small amount of massaging might also be necessary to help achieve the perfect result. 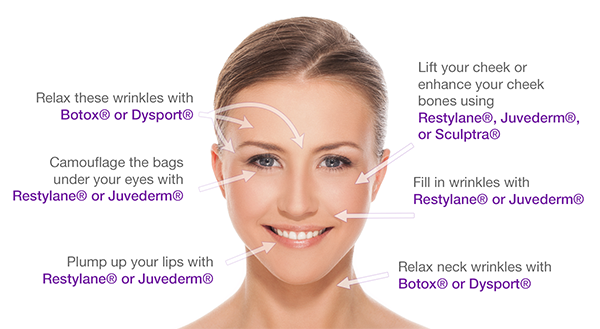 This is in contrast to Botox® and Dysport®, in which massaging after treatment is not recommended. The results are immediate and will usually last between six to twelve months.